Backupify – No that is not an actual word. It is the name of a lifestream cloud backup service we are going to look at today. We use a lot of cloud services, social networking websites, share pictures, save interesting links online and they are all scattered everywhere in the Internet. It is not that common for popular online services to vanish and disappear. But there is always a chance your account is lost or suspended or something unfortunate happens that you can’t get to your account anymore! Here is a case in point where Amit lost his Gmail account for a while. We backup all our computer data (if you are not, I highly recommend checking out Carbonite or Dropbox) but how about all our online data? This blog post makes a convincing attempt at why we should be backing up our online data. 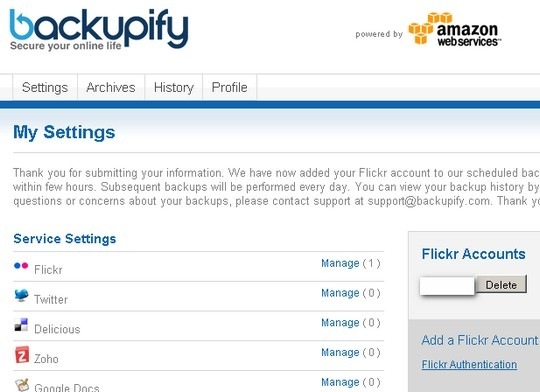 Backupify hopes to backup all your online account data in one place for you! Backupify lets you hook up your online accounts with your Backupify account and it takes care of backing up all your data in one place! Coming soon: Youtube, Xmarks, RssFeed & Tumblr. 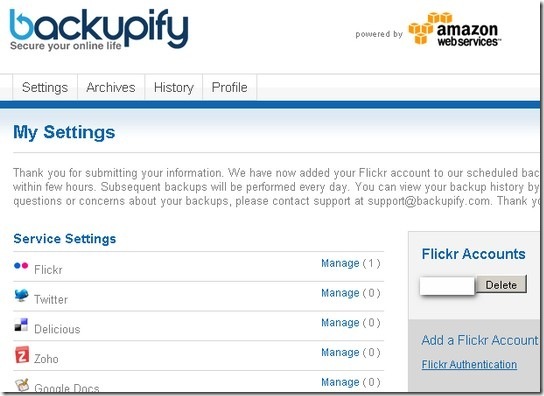 Until January 31st, Backupify is offering free lifetime backup for new users. So, go ahead and sign up for your account even if you are not so sure at the moment. You can setup the backups to happen daily or weekly. You can also setup to get an email every time a backup is performed or a daily/weekly digest of all activities. For most services, they don’t store our usename/password but use a token where we authenticate the service one time. But for services that don’t have this like iPhone or Hotmail, they do store your username/password using advanced encryption (no details?). Backupify service looks well thought out and designed with security in mind. But, I am still a little wary of backing up my main Gmail account to it (it’s temporarily disabled due to high volume) but have no problem configuring my other online accounts. It’s the same logic how I store all my non-critical passwords in the excellent online password manager Passpack. I highly recommend you try out Backupify and make use of this incredible free lifetime offer before January 31. In fact, I am considering adding it to the free apps I am thankful for this season! back up flickr? Is that really necessary? I’ve already created my account! It is a fact that we are trying to keep and producing more data online that on our hardwares.